It’s 10:30pm. We back out of the driveway. The sky spotted with stars, and oak-lined hills of the Austin, Texas horizon. We roll down the windows and wave a hearty goodbye to Seema, Abhay, and their son Nishu, our full-of-heart hosts for the 40-person Empty Hands living room gathering that had transpired this evening. Three silhouettes and three raised arms wave back from the edge of the driveway. Even in the dark, the image of their smiles sticks in our minds like the glow of a crescent moon. As we head off down the road and back to our local host family’s home, I’m struck by the beauty of this journey’s hellos and goodbyes—the invisible threads of resonance and relation that have snowballed into a stunning stream of warm glad-to-meet-you or nice-to-see-you-again hugs, open-hearted stories, genuine moments of connection, and overall lightening of spirit. Whether on the East Coast or West, the hospitable South or friendly Midwest—from suburban living rooms to inner-city schools, rustic sanctuaries to hotel convention halls— the people are beautifully distinct and stories strikingly similar. Seema stumbled across an Empty Hands Music video on someone’s Facebook link and dropped an email about hosting an event in her home during the Austin leg of the tour. Earlier in the year, Heather came across Being Kind, passed it to her dear friend Sandra who sent it to Joan who invited Nimo to share space at the Marblehead Zen Center in Massachusetts. Nestled in an intimate Awakin Circle at Arathi and Joel’s apartment in DC, we meet Danny. On one of our last days in town, we serendipitously run into him on a park bench, and he tells us we have to do a gathering with his friend Cherie in Albuquerque, NM. One after another, online or offline, the sparks of resonance fire and light the way for our ever-evolving roadmap on this Empty Hands Music Pilgrimage. On this tour, each day is a blend of open spontaneity and structured commitments. Every week is filled with new personality dynamics, from traveling companions to host and event demographics. In addition to the sweeping physical landscapes—New England forests to midwestern corn fields to deep Louisiana swamplands, New Mexico deserts and majestic Colorado mountains—the pilgrimage has blessed us with an incredible, eclectic, and down-to-earth opportunity to harmonize with pockets of humanity across the US. From community to community, state to state, we are touched by small gestures of care, love, hope and gratitude. Moments of heart have become the underlying tempo of our journey. In Austin, Texas, we arrive back at longtime friends-turned-family Amir and Priaya’s home late one night after a full day of events, and 6-year-old Laika bounds towards us with wide eyes. “I have a surprise! I have a surprise for you!” Her eyes glow and she pulls us to the living room. Mommy Priya and Grandma Mamaji sit stunned on the couch, next to two piles of coins, bills, and an overturned piggy bank—a total of about 40 dollars. “I’m giving you my money. Give it to your kids in India and do something nice for them,” she instructs us with a no-nonsense, no questions asked, sensibility. We refuse at first, and then her purity of intention coaxes us to finally receive some of the money on behalf of the slum children in India, with the agreement that she will use the rest to do acts of kindness with her family over Labor Day weekend. “Laika, why do you want to give this to us?” I ask. We give her massive hugs, and she hands over a drawing. It reads, “Be Kind” in bold green block letters with a sentence-long caption of gratitude for her Uncle Nimo, who had inspired her to be kind and giving. We find ourselves humbled by the purity of Laika’s offering, blown away by the sense of generosity she has tapped into, and with our hearts charged up at 11:30pm on a Sunday night, we’re completely wiped of any sleepiness that had washed over us during the drive home. As we move from place to place, among longtime friends or strangers, the innocence of kindness carries us home again and again. In Washington DC, Ellie’s godfather generously hosts us for the entire two weeks we are in town. A Vietnam War vet and retiree, his gentle, respectful presence infuses our hearts as we learn that he takes in elderly rescue dogs during their last few years and pampers them with love. We watch as he glowingly prepares gourmet doggy meals, schedules spa-like grooming sessions, and handles their old age digestive and mobility hiccups with motherly patience and care. 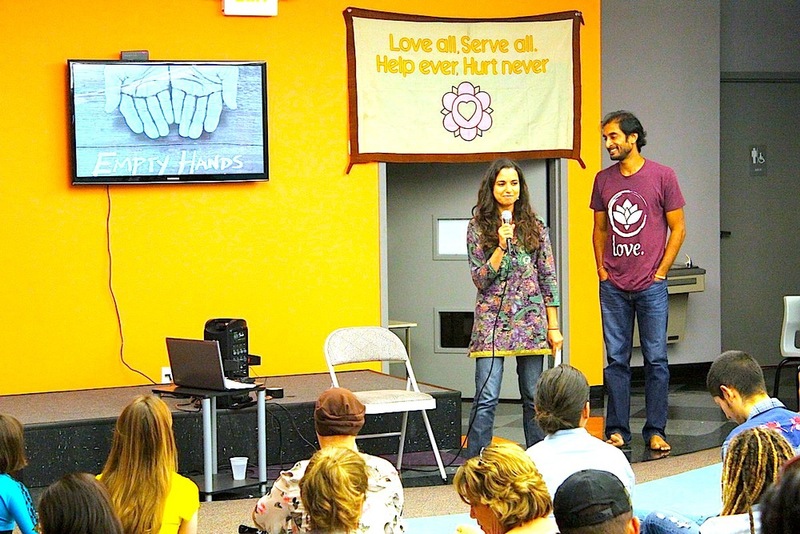 In Chicago, we are blasted with the “love all, serve all, share all” spirit of Manav Sadhna, an NGO based at the Gandhi Ashram in Ahmedabad, India. At a weekend volunteer reunion, we encounter an anonymously gifted deep-dish pizza dinner (complete with heart-shaped pies), collaborate on random acts of kindness at a local park, and sit in a circle of attentive presence and sincere sharings. At a gathering in Ohio, we meet siblings Maddie and Luke, who share about their experience making a lemonade stand and offering cups anyway to those who didn’t have cash on them to pay for it. We hear how one woman’s daughter makes a pop-in-the-oven lasagna for her to enjoy when she comes home. Another received 25 trays of primrose just because, and got inspired to gift the goodness forward amongst her neighbors and friends. The next day, we pull up to the home of Kay and Conrad, who has been diagnosed with cancer and a few months left to live. In the grace of their loving riverfront home, we smile wide at the floor-to-ceiling picture-frame lined bookshelf, with shining grins of their 4 children and evolving portraits of their 11 grandchildren. Braced with an oxygen tank, 82-year-old Conrad speaks in gentle whispers interspersed with long breaths. We have the blessing of being in physical presence with him in a collective Awakin Call interview, as he shares poignant, philosophical, and refreshingly simple life lessons. At the end of the hour and a half long call, he is clearly ready to rest, but he steadfastly pulls himself up to give us a hug and smother us with grandfatherly good-bye kisses. Eight days later, he passes away in the warmth of his home and company of his family. Each day is filled with snapshots from all angles of life, reminders of the empty hands with which we come and empty hands with which we go from this life. Over breakfast in New Jersey, our host and dear sister Manal gets a call that her bedridden grandmother had just breathed her last breaths. In DC, Nimo learns that his cousin in the UK passed away. At Unity Church in New Braunfels, Texas, we enter a room lovingly dedicated to a teenage boy who had committed suicide earlier that year. In Houston, the living room turns into a chorus of coos and giggles as 7-month-old Anayah playfully tilts her head at the circle of adults around her. Outside Baltimore, we are captivated by 3rd grader Jasper’s lego architecture designs and self-composed piano jams, and story of how he crumbled up crackers that morning to feed the ants in his backyard. Near the Appalachian Trail, we stop to pet two grazing horses in a backyard pasture. In the Louisiana swampland, we spend two hours staring at baby alligators in the river. Somewhere between Texas and New Mexico, a hillside specked with white turns out to be a herd of goats moving across the land. Day in and day out, we are continually humbled by the breadth of life, diversity of experience, and unity of the human spirit. At Bloombars in DC, we meet recent college grads Matt and Jason, who are on a bike comedy tour across the Midwest and East Coast, sharing laughs and seeking out a deeper purpose in the streams of strangers, sights, and experiences they encounter. In a rural pocket of Ganges, Michigan, Mataji, and Babaji regale us with tales from their four decades of cultivation in service and stillness at the Mother’s Trust Ashram and Retreat Center. In Atlanta, teenager Kendall raps on how “love is my religion” and expresses gratitude for having a positive role model in his father. In Albuquerque, NM, we are welcomed into the homes and lives of three generations tied together by one father’s plot of land and reverence for nature. With a full, ever-evolving schedule (yet always with room for last-minute ebb and flow changes), the labor-of-love intention of this Empty Hands Pilgrimage enables an expansiveness to emerge in each day. Though the days may be long, and weeks often feel like years due to the richness of each moment, the spirit of offering with no expectation enables us to show up simply as we are. The size or turnout of a gathering doesn’t matter so much as the intention behind it. There’s no performing or role-playing or feeling of needing to impress. We come simply as ourselves, and each gathering holds space for everyone to shine in their own authenticity. Across personalities and lifestyle preferences, each moment becomes an opportunity to practice care, acceptance, and love. Even the car-rides become a space to share in that way. From Chicago to Tennessee to Atlanta to Texas, the drives are filled with English lessons for Ajay (who grew up in the slum community in India and through our wonderful non-profit Manav Sadhna, is making his first visit to America) and Gujarati lessons for me, spontaneous thinking-of-you speakerphone calls to friends and family, or one of us pointing out a new sight to Ajay. On the first drive of the day, we put on the Manav Sadhna ‘all-religions’ prayer and sit in silence as the words of reverence sink into us. Sometimes the passenger seats are deep in stillness or slumber or genuine conversation. Other times, we are doubled over in laughter as Nimo and Ajay bust out in a spontaneous rap about the day. In jest or in seriousness, music emerges again and again as a vehicle for honest expression, heart-centered connection, and transformation. At a gathering in New Jersey, hip hop artist, educator, and organizer Chad Harper sings “To My People” alongside Nimo. The sincerity and love they pour into their words and rhythm and song cut straight to the heart. By the end of the piece, the energy in the room is open, palpable, and full of receptivity. Chad shares some stories of his work teaching youth humanity through hip hop, then hands the mic over to his brother and colleague Negus Vega to offer any thoughts. In a moving share, Vega discovers his own neighbors in the room, offers some winding lessons from his life, work with youth, hip hop and poetry, and blows us away in a spontaneous off-the-cuff rap on the power of love. There’s something about music that goes straight to the heart. Through the offering of creative expression, truth, and vulnerability, it empowers the singer and taps into a resonance with the listeners. Throughout the tour, so many artists and musicians have shared some powerful beats, beautiful poetry, and soul-stirring vocals. But beyond the sound of it, what’s hits home is that these artists are inspired to use their music as an instrument to send ripples of positivity into the lives of others. Third grader Jasper tells his mom that he wants to grow up to write music that makes people think. In McAllen, Texas, Shawn from The Vangoes spends an afternoon folding clothes at a refugee shelter, and finds himself in deep conversation with Nimo on the nuances of music, ego and performance, and questions of art, money, and channeling creative energy constructively in the service of others. In Massachusetts, young Maherlyn belts out an A cappella rendition of self-composed song, “Just Breathe” and shares her hope to empower others through music. Everywhere we go, small gestures of kindness, courageous offerings of love, and inspired expressions of the soul overtake us. Just like that, each moment is a chance to give and to let go. To be both full and empty. In that spirit, each soul we’ve come across has been a guide for our own transformation. Each honest expression-- each story of kindness or gesture of gratitude-- strengthens the volume of our own heart. And in so doing, it deepens our faith in humanity, and strengthens our commitment to serve our interconnectedness. As the scenery changes from one corner of the country to another, our optimism grows with the gift of knowing that love exists in all corners, all facets, all pockets of the world. All we have to do is open our eyes to see it, and empty our hands to give of our hearts and ourselves. Welcome to the Empty Hands Music Blog, a space to share stories and spotlights, reflections, learnings, and snapshots from the journey.